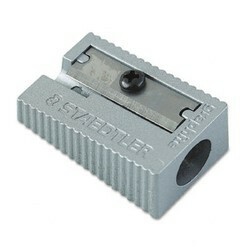 Our reputed entity is engaged in supplying Staedtler Pencil Sharpeners. Manual pencil sharpener with quality blade gives fine point. Unscrew cap to empty pencil shavings. Made of metal. 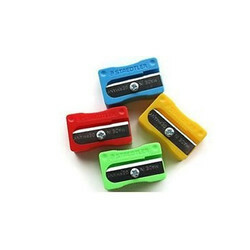 - Heavy-duty electric Pencil sharpener Designed specifically for classrooms. - Durable construction stands up to wear and tear. - Quiet electric motor provides reliable power with minimal disruption. - Flyaway cutter system stops cutter automatically when Pencil is Sharp. - Helical steel cutter produces safe, rounded Pencil points.